Fusarium solani infections are increasingly reported in both immunocompetent and immunocompromised patients. , The causative fungus is a type of hyalohyphomycosis, in which basic tissue form of fungus is hyaline. Mycetoma is chronic infection of skin and subcutaneous tissue caused by fungus (eumycetoma) and bacteria (actinomycetoma), usually follows trauma. First report of mycetoma was given by Dr. John Gill from Madurai, India. Fusarium solani causing mycetoma is rare, and only few cases are reported in literature. The present case is the first report from South India. A 45-year-old male presented with asymptomatic subcutaneous swelling of left heel and right forefeet of 15 years duration with 2 ulcers over sole of right foot. Onset was insidious and spontaneous in nature. There was no history of trauma or prick by wooden splinter or thorn. Swelling was painless and gradually increased to the present size. Patient ignored the swelling, as it was not bothering. Recently, he developed 2 ulcers over right foot spontaneously. There was no history of discharge or grains from the ulcer. Examination revealed gross subcutaneous swelling of heel of left foot with few nodules with verrucous changes of overlying skin and few pinpoint pustules [Figure 1]. Other parts of left foot were normal. Front portion of right foot was grossly swollen and deformed with a 2 × 2 cm oval superficial ulcer with irregular borders, sloping edges, and pale granulation tissue at the floor was seen [Figure 2]. Blood investigations like complete blood counts, blood sugars, liver and renal function tests were within normal limits. X-ray of bilateral foot was done, which showed osteolytic lesions in right foot. Skin biopsy was sent to pathology and microbiology for evaluation. Histopathological evaluation showed hyperkeratosis, parakeratosis, and acanthosis of epidermis. Dermis showed infiltration by neutrophils and lymphocytes. Special stains for fungus were negative. KOH mount with additional parker ink of the biopsy sample showed thin, slender, branching, septate, hyaline filamentous fungi appearing blue [Figure 3]. Fusarium solani was grown on Sabourauds dextrose agar at 28°C showing off-white, aerial, fluffy to floccose obverse with pale yellow, diffuse reverse pigmentation, and second biopsy sample was sent for confirmation. 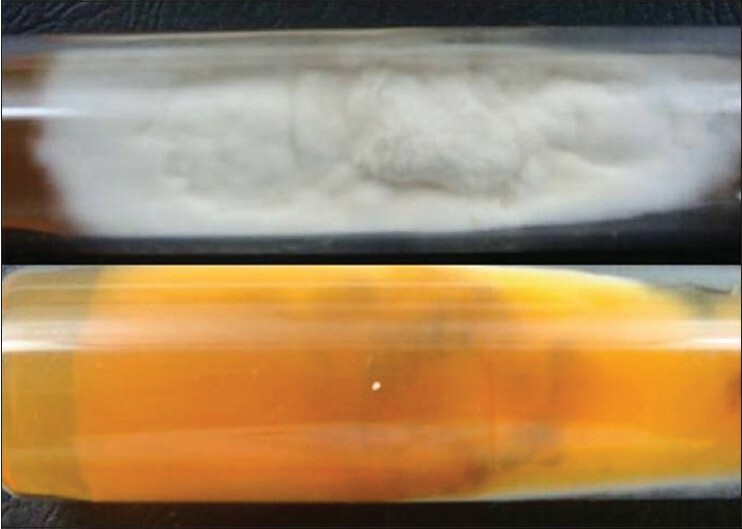 Culture of second biopsy sample also showed growth of Fusarium solani [Figure 4]. 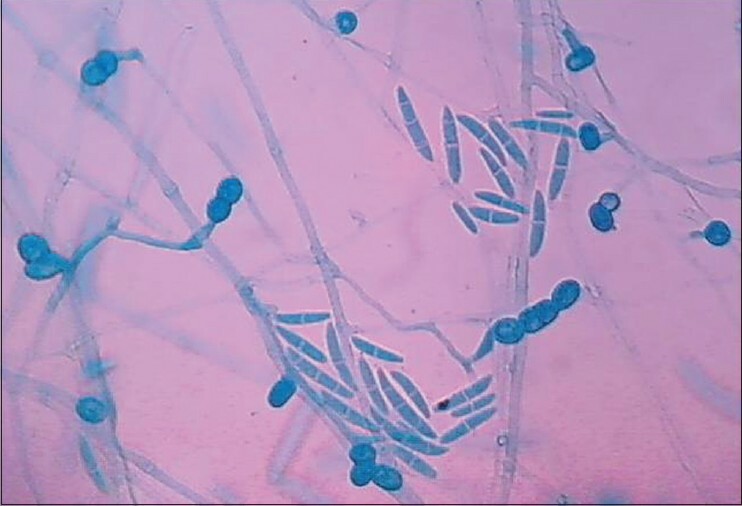 Microscopy of lactophenol cotton blue slide culture mount of Fusarium solani revealed thin, slender, hyaline hyphae with septate, fusiform macroconidia, microconidia, and chlamydospores. Patient was started on itraconazole 100 mg twice-daily with regular follow-up. Patient showed good improvement after 2 months with healing of ulcers in the right foot and reduction in swelling in left foot. The term hyalohyphomycosis is coined by Ajello and colleagues in 1974 (Gk. Hyalos - glass),  in which basic tissue form of fungus is hyaline i.e., without any pigment in cell wall. Fusarium solani is found in soil with wide range of climates. Infection caused by Fusarium solani can be of 3 types; mycotoxicosis, locally invasive, and disseminated infections. Cutaneous lesions commonly seen with fusarium infections are ecthyma-like lesions, target lesions, and multiple subcutaneous nodules. Among fusarium species, F. solani, F. oxysporum, and F. verticilloides cause human infections very often. Disseminated infections are seen in patients of hematological malignancies and occasionally in patients of extensive burns. The infection is acquired through inhalation of aerosolized conidia or through breaks in integumentary barriers. Mycetoma is common in tropical and subtropical countries of Asia, Africa, and central and South America. In India, large numbers of mycetoma cases are seen in Tamil Nadu and Rajasthan. It is more prevalent in rural population than in urban. The disease is commonly seen in young adults of 20 to 40 years old. Infections are more commonly seen in men because of outdoor activity and traumatic implantation of fungal propagules. Microscopically, the hyphae of Fusarium solani in tissue resemble those of Aspergillus species, filaments are hyaline, septate, and 3-8 microns in diameter. They typically branch at acute or right angles. The production of both fusoid macroconidia (hyaline, multicellular, banana-like clusters with foot cells at the base of the macroconidium) and microconidia (hyaline, unicellular, ovoid to cylindrical in slimy head or chains) are characteristic of the genus Fusarium. If microconidia are present, the shape, number of cells (usually one to three), and mode of cell formation (chains or false heads) are important in identification. The prevalence of etiological agents of mycetoma varies in different parts of the world. In India, eumycetoma is more prevalent in Northern India with commonest agent being Madurella mycetomatis and actinomycetoma in South India. There are no reports of Fusarium solani causing mycetoma from South India. Fusarium spp. causes white grain eumycetoma. Grains of fusarium are soft in texture, 0.2-0.6 mm in size, and oval in shape. They have a rapid growth and mature within 4 days. Colonies of Fusarium solani are initially white and cottony, but often quickly develops a pink center with a lighter periphery. In literature, about 23 cases of eumycetoma caused by Fusarium solani have been reported. ,,, Morphological identification of the Fusarium genus was often difficult; identification is based on the white-yellowish color of the grains, the light-brown colonies (with a reddish diffusing pigment in some cases), and genus-characteristic sickle-shape spores. Treatment of Mycetoma caused by Fusarium species is difficult and remains unclear. Fusarium spp. is one of the most drug-resistant fungi known. Voriconazole, itraconazole, and the polyenes (amphotericin B and its lipid formulations) have shown some success in disseminated fusariosis. Voriconazole is the only drug useful in treating refractory fusariosis infections. We recommend itraconazole in the treatment of mycetoma caused by Fusarium solani. 1. Yera H, Bougnoux ME, Jeanrot C, Baixench MT, De Pinieux G, Dupouy-Camet J. Mycetoma of the Foot Caused by Fusarium solani: Identification of the Etiologic Agent by DNA Sequencing, J Clin Microbiol 2003;41:1805-8. 2. Nucci M, Anaissie E. Fusarium Infections in Immunocompromised Patients. Clin Microbiol Rev 2007;20:695-704. 3. Khan KA, Khan AF, Masih M. Clinical and pathological findings of mycetoma with special reference to the etiology. Asian Med J 1984;27:250-7. 4. Vandyke CH. On mycetoma or the fungus disease of India, London: J and A Churchill; 1874. 5. Murthy RB, Padmavathy D. The etiology of mycetoma. Indian J Microbiol 1963;3:99-102. 6. Ajello L, Padhye AA, Chandler FW, McGinnis MR, Morganti L, Alberici F. Fusarium moniliforme, a new mycetoma agent.Restudy of a European case. Eur J Epidemiol 1985;1:5-10. 7. Lee S, Yun NR, Kim KH, Jeon JH, Kim EC, Chung DH, et al. Discrepancy between histology and culture in filamentous fungal infections. Med Mycol 2010;48:886-8. 8. Padhi S, Uppin SG, Uppin MS, Umabala P, Challa S, Lakshmi V, et al. Mycetoma in South India: Retrospective analysis of 13 cases and description of two cases caused by unusual pathogens: Neoscytalidium dimidiatum and Aspergillus flavus. Int J Dermatol 2010;49:1289-96. 9. Baudraz-Rosselet F, Monod M, Borradori L, Ginalsky JM, Vion B, Boccard C, et al. Mycetoma of the foot due to Fusarium sp. treated with oral ketoconazole. Dermatology 1992;184:303-5. 10. Nakar C, Livny G, Levy I, Samra Z, Linder N, Ashkenazi S, et al. Mycetoma of the renal pelvis caused by Fusarium species. Pediatr Infect Dis J 2001;20:1182-3. 11. Nucci M, Pulcheri W, Spector N, Oliveira HP. Pulmonary mycetoma treatment in neutropenic patients, Rev Assoc Med Bras 1993;39:188-9. 12. Tomimori-Yamashita J, Ogawa MM, Hirata SH, Fischman O, Michalany NS, Yamashita HK, et al. Mycetoma caused by Fusarium solani with osteolytic lesions on the hand: Case report. Mycopathologia 2002;153:11-4.